Im researching lighting for a 90 gallon reef. The tank is 24" deep and was curious which if either is better. 8 bulb retro fit kit with reflectors or two 4 bulb wave point fixtures?? What are you planning on keeping in the tank? If it is FOWLR lighting really doesn't matter. 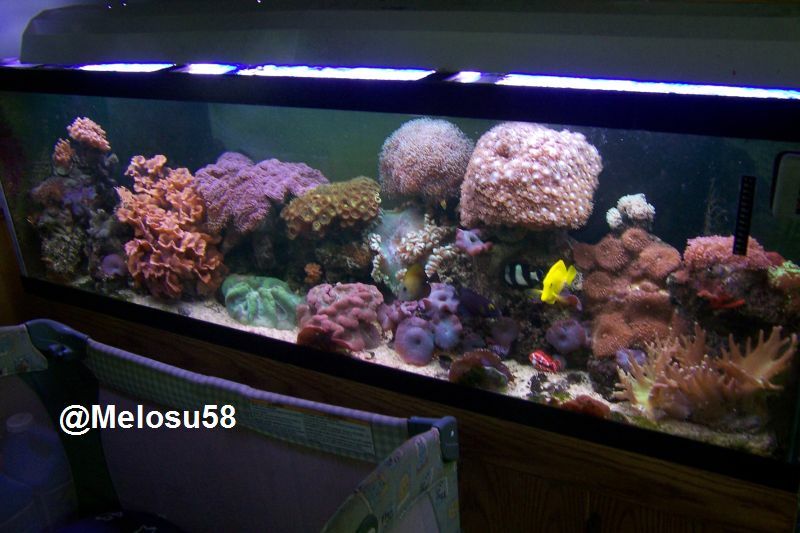 If you are planning a reef then you will want more lighting than that. Moved to General Hardware and equipment discussions. I do want a reef. What watt per gallon should I strive for? ( I know it's not accurate) The 8 bulb setup would put me around 432 watts. I don't think I can fit anymore lights under my hood. I think you would be fine with what you are aiming for. 432 watts should be great in my opinion. I only have 6 bulbs over my reef tank and the corals do really well. I know I'm over thinking this, but I can get four bulb wavepoint fixtures for 150 off Craig's list or the reflectors and two more ballasts for the same. So price is not the situation because they will be around the same. Is the retro still a better choice. I'm sorry if I'm being a pain. I would go with the reflector setup. If I'm not mistaken the wavepoint fixtures do not have individual reflectors. I'll be honest, and it is still hard to believe I say this everytime I do, if you can't get 8 bulbs under your hood then I'd go LED. This is where I normally que in whoever it is that raves about the cheap chinese knockoffs that are treating their SPS great...I know Mr. X is using them, but there are others as well. I'll stick to my radion(s) though. I can get the 8 bulbs. That's not the problem. I was curious which o the two options was best. Led lighting would be cool if it didn't cost more than my entire tank setup. What cheap Chinese fixtures do you speak of?